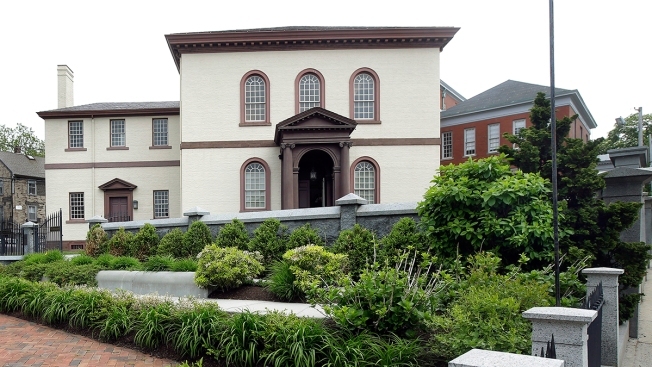 In this Thursday, May 28, 2015 file photo, the Touro Synagogue, the nation's oldest, stands in Newport, R.I. The congregation that worships at the nation's oldest synagogue has prevailed in a bitter legal fight that threatened its existence. The lawsuit pitted congregants at the 250-year-old Touro Synagogue in Newport, Rhode Island, against the nation's oldest Jewish congregation, Shearith Israel in New York City. U.S. District Judge Jack McConnell on Monday awarded the Newport congregants control over Touro as well as over a pair of ceremonial bells valued at $7.4 million. The synagogue was dedicated in 1763. George Washington once sent congregants a letter laying out the fledgling government's commitment to religious liberty. The New York congregation became trustee of Touro in the 1820s after Jews left Newport. Its leaders fought the Newport congregation's plan to sell the bells to raise money for an endowment, and sought to evict them.